This exquisite, resonant novel by PEN/Faulkner winner James Salter is a brilliant portrait of a marriage by a contemporary American master. It is the story of Nedra and Viri, whose favored life is centered around dinners, ingenious games with their children, enviable friends, and near-perfect days passed skating on a frozen river or sunning on the beach. But even as he lingers over the surface of their marriage, Salter lets us see the fine cracks that are spreading through it, flaws that will eventually mar the lovely picture beyond repair. 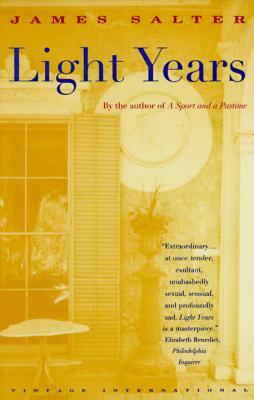 Seductive, witty, and elegantly nuanced, Light Years is a classic novel of an entire generation that discovered the limits of its own happiness—and then felt compelled to destroy it. James Salter authored numerous books, including the novels All That Is, Solo Faces, Light Years, A Sport and a Pastime, The Arm of Flesh (revised as Cassada), and The Hunters; the memoirs Gods of Tin and Burning the Days; the collections Dusk and Other Stories, which won the 1989 PEN/Faulkner Award, and Last Night, which won the Rea Award for the Short Story and the PEN/Malamud Award; and Life Is Meals: A Food Lover’s Book of Days, written with his wife, Kay Salter. He died in 2015.